1. Adjust 2 oven racks to top and bottom position. Preheat oven to 400°. Line 2 rimmed baking pans with parchment paper or nonstick foil. In large bowl, combine pie filling and dried cherries. In small bowl, whisk together egg and milk. In separate small bowl, combine sugar and cinnamon. 2. Unroll and separate 1 package of dough into 4 rectangles on work surface; pinch perforations to seal. Place about 2 tablespoons apple mixture on center of each dough rectangle; top each with 1 piece of cream cheese. Fold dough diagonally over filling; fold any excess dough up and pinch. Seal edges with fork. Repeat with remaining packages of dough, apple mixture and cream cheese. 3. 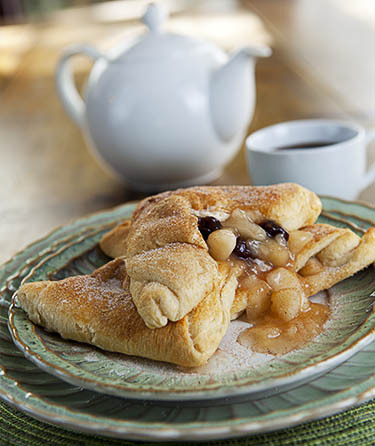 Place turnovers on prepared baking pans; brush turnovers with egg mixture and sprinkle with sugar-cinnamon mixture. Bake 15 to 17 minutes or until golden brown, rotating pans between upper and lower racks halfway through baking. Cool 10 minutes and serve warm.